The recently updated database of the World Governance Indicators (WGI) shows an improvement in Armenia’s ranking in political stability, fight against corruption, government effectiveness and regulatory quality. A project of World Bank and Brookings Institution, WGI provides governance ranking of over 200 countries since 1996 on six indicators: Voice of Accountability, Political Stability and Absence of Violence, Government Effectiveness, Regulatory Quality, Rule of Law and Control of Corruption. WGI uses a 0-100 percentile ranking indicating the rank of the country among all countries in the world where 0 is the lowest and 100 the highest rank. Despite the reported progress, however, Armenia is still at the lower 50 percentile of the countries included in the study. Where does Armenia stand in the list of the post-Soviet countries? Armenia is scoring higher than most of the post-Soviet countries (excluding the Baltic states) on all the indicators except Political Stability and Voice of Accountability. Armenia’s score on Voice of Accountability, an indicator capturing citizens’ participation in selecting the government, freedom of expression, freedom of association and free media is not only low, but it has deteriorated over the last decade. 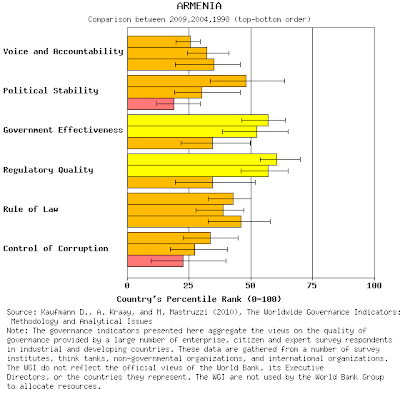 Armenia along with the rest of the post-Soviet countries is also ranked low on the Control of Corruption indicator, with the majority of the countries at the 0-25 percentile. Georgia is scoring significantly better than other post-Soviet countries. 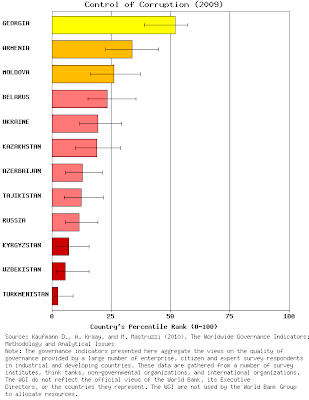 Actually, Georgia is leading the list of the post-Soviet countries on all the indicators except the Political Stability and Absence of Violence indicator, where it is ranked at the same percentile with Russia, Uzbekistan and Tajikistan (0-25 percentile). In the light of the contested presidential elections of 2008 it is rather surprising that Armenia (ranked at the 25-50 percentile) has recorded improvement on the indicator since 2004. The aggregate indicators combine the views of large samples of the citizens, experts, enterprises and other available indexes. Detailed methodology and documentation is available on the WGI website. The website also provides a user friendly analysis tool, which creates tables and maps by country, allowing also by year comparisons. Full dataset are publically available and can be downloaded here. And, as always, a reminder that CRRC has done a comprehensive corruption survey of households and business, with materials available here.